Bouncy, trouncy, flouncy, pouncy, fun, fun, fun, fun, fun! 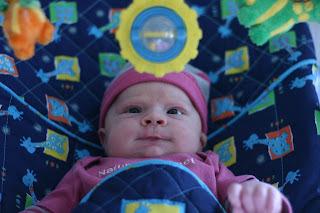 Up until this week, Margot has hated her bouncy chair. Now that she can see all the way to the toys and focus on them (two developmental feats that we're very proud of! ), she's content to sit in the chair. I wouldn't say that she loves it, but it provides something interesting to stare at apart from the perennial favorites: light bulbs and windows. While B would be cool, it might be too spooky to have a telekinetic child. Only time will tell.